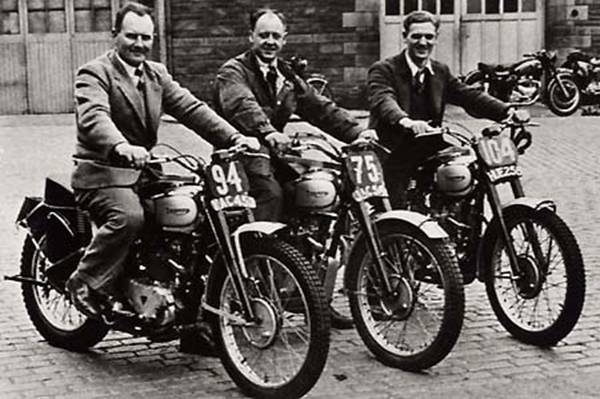 Triumph had an excellent record in the ISDT, providing machines used by the British Team to win major awards five times between 1948 and 1953. 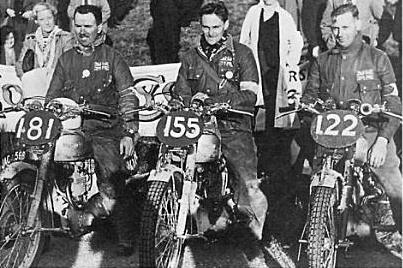 Team riders had to ride in two separate engine capacity classes, so Triumph fitted some of its 500cc Trophy twins with bigger engines for the event. 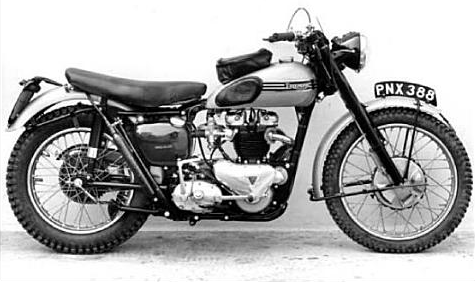 Prior to 1954 the 650cc Thunderbird unit was used, but PNX 388 was built by installing the new 42bhp 650cc Tiger 110 engine designed for fast road work in the swinging arm frame first seen at the 1953 ISDT. The two-into-one exhaust is tucked high and the centre stand further rearward than usual, to maximise ground clearance. Other typical ISDT touches are a ‘nail catcher’ to prevent front tyre punctures and an air bottle for rapid tyre inflation. T-bars on the wheel spindles aid fast repair work, while a bag on the fuel tank carries tools and maps, and back-up control cables are already in place. 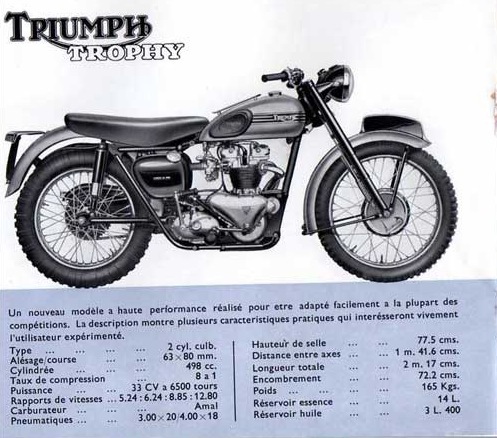 The production Trophy TR6 based on the Alves bike appeared in Triumph’s catalogue for 1956. 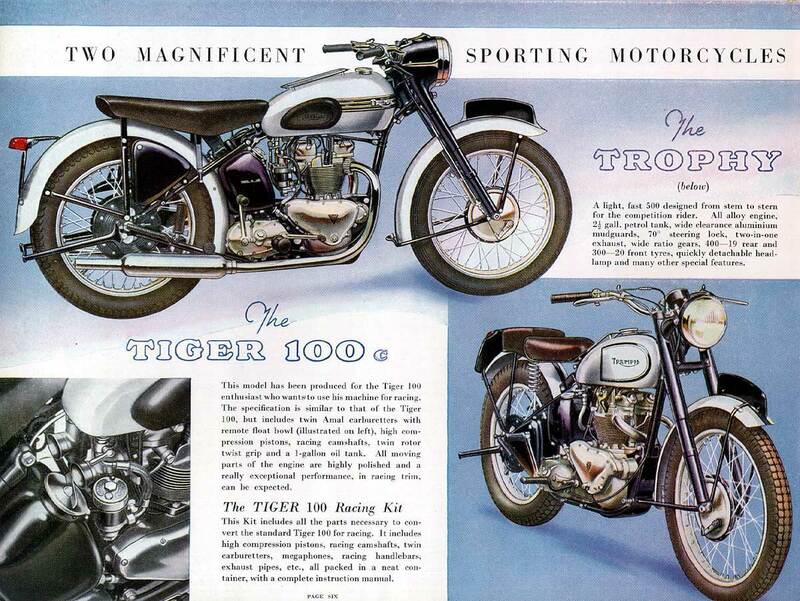 Rugged agility and lusty power made it a strong seller, especially in America. 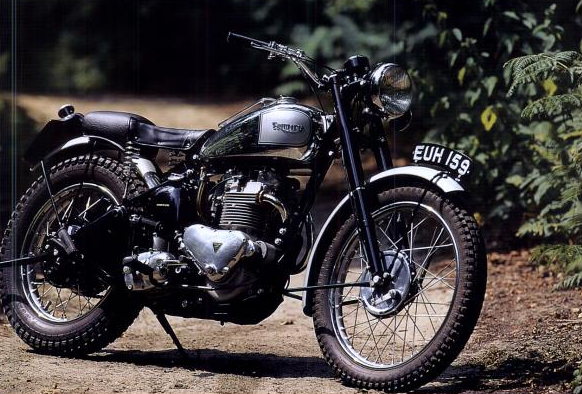 The Triumph Trophy was Triumph’s bold statement of 1949 introduced as a classic dual purpose motorcyle that was capable of being a serious off road racing contender at that time. 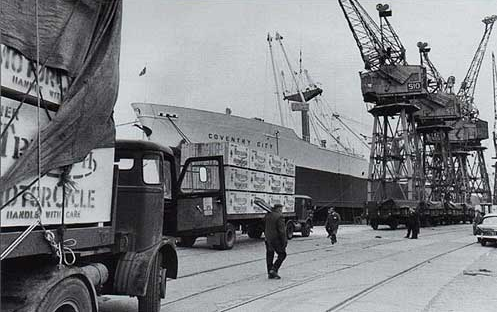 Photo of a dockside scene 1950 A freight ship called Coventry City, a US dock with trucks loaded up with crates of Triumph Motorbikes long before containerisation… so answers on the back of a postage stamp please…. 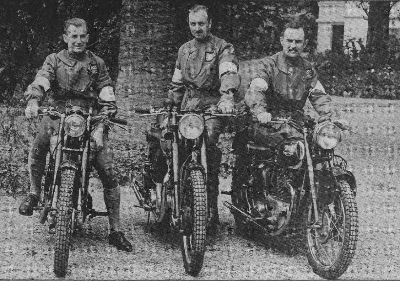 British Industry and the motorcycle.. where did it all go wrong? Nice site, but surely RIgid TR5 should be 20″ front wheel. That is what all the parts book show and this size wheel went for the first year of the swinging arm TR5’s. for some years 20″ tyres were hard to get hold off so users rebuilt the wheels as 20″. No problem now though in obtaining 20″ tyres. For future viewers reference can the site preparer check this and correct if necessary. Again great site. I have just completed a rebuild of a October 1954 TR5. Kevin thank you for your post and comments. Much of the material early material originates from Taff Isaac’s first speedtracktales.co.uk site, more modern material is usually connected to a blog entry. My reason for involvement was only to try to find a public home for some old images of the ISDT I had when I found the old site abandoned I then ended up owning it. Agreeing to take it on meant a reformat of layout on wordpress and then restoring the old data however there were so many areas still lacking material or images were untitled I invested time to fill the gaps supported by a small group of helpers on the old site. We have no appointed checker and much of the old material is taken at face value and when corrections are offered they are gratefully received. Amongst those helping are ISDT experts like Brian Catt and the VMCC knuckle in from time to time. 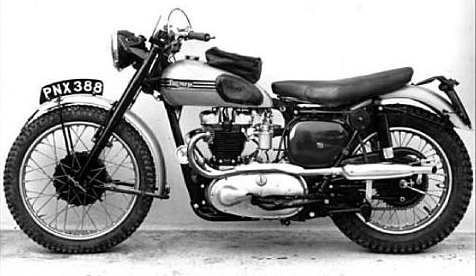 If the details of the Triumph are wrong my apologies. We are of course gathering new material and this is usually validated before inclusion. If you see other errors or inaccuracies please drop a comment on the page involved. I have limited time to do this and if anyone reads this with writing skills and time to help who would like to become a contributor, I can arrange an account for that person to create and edit pages if they would like. This is not so much my site it belongs to the ISDT community I am simply the guardian / librarian / curator.